Shop Pioneer Postbound Travel Album with Photo Window 12 inch x 12 inch (1 ea. )1 ea. 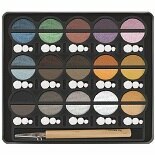 Shop Pebbles I Kan'dee Chalk Set (1 ea. )1 ea. Shop American Crafts Cardstock Pack 12 inch x 12 inch (60 ea. )60 ea.